I got my camera back from Nikon yesterday. Excellent turnaround time – I sent it on Tuesday and got it back on Friday; and it looks like the sensor spots are completely eliminated; I hope it stays that way. Needless to say, I was back out again yesterday with my camera. And I was rewarded with a glorious sunset. 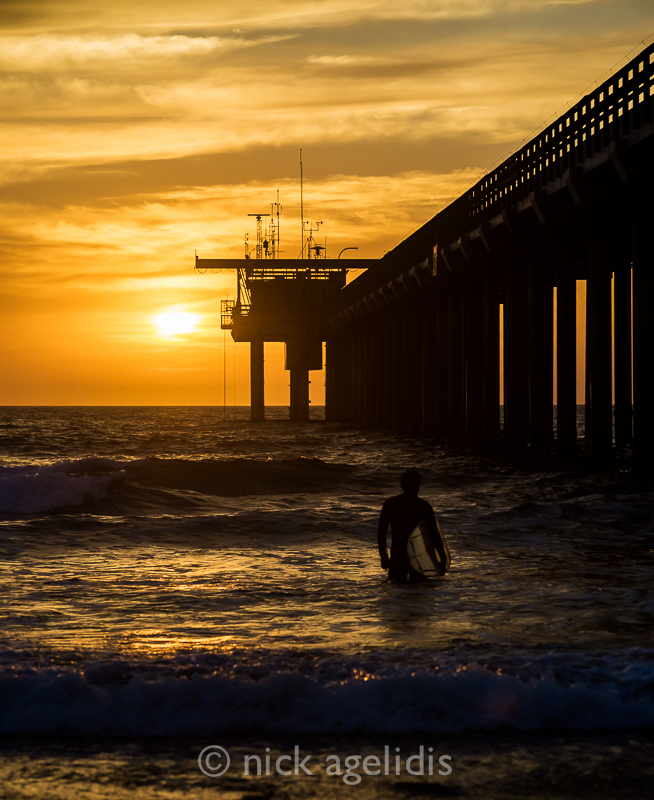 The Scripps pier at La Jolla Shores attracts a lot of photographers, and this time of year the sun sets right in line with the direction of the pier. I took some late afternoon photos at a couple of other locations first, so by the time I got to the pier, there were a couple of serious photographers already there with their big tripods aimed directly up the length of the pier. I had left my heavy Manfrotto at home and was instead using a light travel tripod, which I recently bought for my upcoming trip to Italy. I was feeling significantly outgunned, but it allowed me to quickly jump around between various locations rather that stay anchored in one place. And I’m glad I did, as I think it allowed me to get a variety of interesting shots. Here are a couple. Now I just need to get my wide angle zoom back, and I’ll be ready for Italy.